Description: The Lift & Load lumber yard is chock-full of hard-to-find pieces that collectors have come to hate (or love if they are fortunate enough to own them). 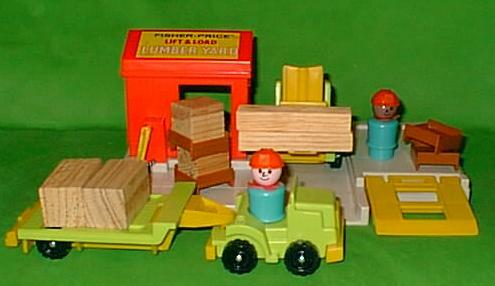 Perhaps the most notable of this rather unremarkable Little People set is the fact that it included real wooden lumber, rather than plastic lumber. 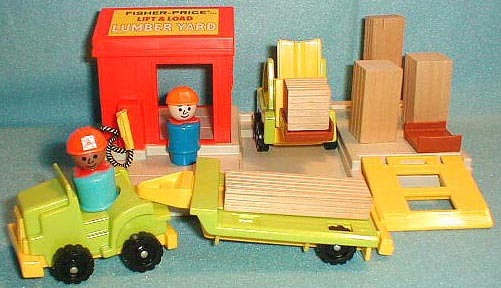 This could be seen as a step back (or forward), considering Fisher-Price had all but stopped using wood in Little People sets by 1978. Not suprising that those blocks are now the hardest of the pieces of this set to find, along with a very uncommon variant--a base with a white floor, oppose to gray. B944A - Small red building on a grey plastic loading dock base. The building has verticle ribbed lines on all 4 sides, an open doorway on the front beside a molded in gas pump. The pump has a black and white braided rope hose with a yellow plastic nozzle on the end. The back wall and back half of the roof are open for easy access inside the building. 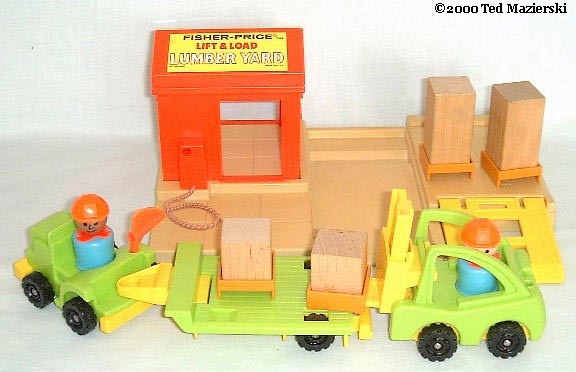 The top front side of the roof has a yellow paper litho marked "FISHER-PRICE LIFT & LOAD LUMBER YARD" in English. 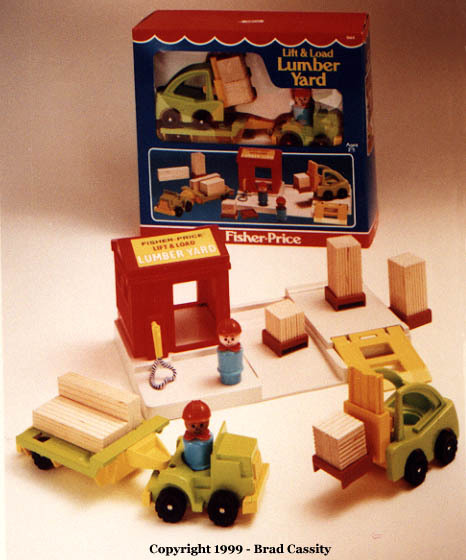 The grey Lumber Yard base has a molded-in parking and loading ramp beside the building. *See "Variations" below. FPT234 - Short squared yellow plastic ramp with 2 square cut-outs in the center of the ramp. The ramp has two small "hooks" on one end to attach to B944 base. FPT494 - Green (Lime Green) 1-seat truck wth a yellow front grill, yellow bottom, and yellow bumpers. The truck has a hole on the back to attach/pull a trailer. The truck rolls on 4 knobby wheels. FPT731 - Green (Lime Green) top, Yellow base flat-bed trailer. Rolls on 2 "knobby" wheels and has a hitch on the front. FPT414 - Green (Lime Green) 1-seat forklift with a Yellow spring-loaded action fork on the front that moves up and down. The fork lift rolls on 4 black knobby wheels. 4 each - FPT269 - Brown square simulated wooden plastic shipping pallet that has 2 edges on the bottom sides to allow the fork on a fork lift to slide under the pallet and lift it. The top of the pallet holds a crate and it has an edge to prevent the crate from sliding off. 2 each - FPT265 - Square block of real wood "lumber sticks". Size: 1-1/8" square cube. 2 each - FPT266 - Long rectangular block of real wood "lumber sticks". Size: 3-3/8" long,1-1/8" wide, 1/2" deep. 2 each - FPT264 - Short rectangular block of real wood "lumber sticks". Size: 2-1/4" long, 1-1/8" wide, 1-1/8" deep. TPP - Light blue construction worker with an orange construction helmet, and an orange non-triangular scarf. SPP - Light blue African-American construction worker with an orange construction helmet, and an orange non-triangular scarf. B944B - Small red building on a white plastic loading dock base. The building has verticle ribbed lines on all 4 sides, an open doorway on the front beside a molded in gas pump. The pump has a black and white braided rope hose with a yellow plastic nozzle on the end. The back wall and back half of the roof are open for easy access inside the building. 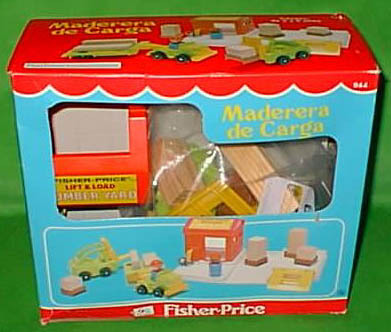 The top front side of the roof has a yellow paper litho marked "FISHER-PRICE LIFT & LOAD LUMBER YARD" in English. The white Lumber Yard base has a molded-in parking and loading ramp beside the building. *This base is very rare. FP944ABOX1979 (Grey Base) - Sold in a 10-1/8" long, 4-3/4" deep, 11-3/4" high box.